DS Newer Super Mario Bros. DS (USA 1.07) "100%" in 2:15:40.51 by Soig. 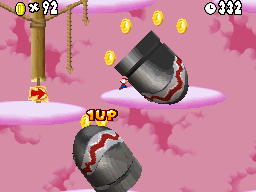 Newer Super Mario Bros. DS is a hack of New Super Mario Bros. that adds entirely new levels and custom enemies, bosses, music and graphics to the DS game. The hack also modifies the Blue Shell of the original game into the Hammer Suit from Super Mario Bros. 3. Soig collects all Star Coins in every level of the game and spends them all in record time.